Buochs, Sui. - The first PC-24 Super Versatile Jet took off on its maiden flight today at Buochs airport in Switzerland. Just under 1,800 Pilatus staff, all of whom are directly or indirectly involved in the PC-24 project, were on hand to applaud the business jet as it taxied for takeoff. Prototype P01, call sign HB-VXA, flew across central Switzerland for a total of 55 minutes. The flight went exactly as planned with no problems. The PC-24 is capable of exceptional performance, and this maiden flight was a first opportunity to showcase some impressive credentials: the twin-engine business jet took off from runway 07 in just under 600 feet and climbed to 10,000 feet (approx. 3,000 metres) in around three minutes, where the two pilots completed a series of meticulously planned tests. The maiden flight followed a route across central Switzerland – from Altdorf to Brünig via Engelberg. Test pilot Paul Mulcahy, who has some 11,000 hours under his belt, flew the PC-24 as pilot in command. He has already test flown countless aircraft types and has acquired a wealth of experience on twin-engine business jets. “Everything looks great so far! Beautiful handling – the PC-24 flies just as expected – a real Pilatus aircraft!”, said second test pilot, Reto Aeschlimann, by radio from the cockpit. Throughout the flight, the PC-24 was accompanied and monitored by a PC-21. As is normal on maiden flights, the PC-24 landing gear was not retracted on this occasion. Twelve flight test engineers watched the flight from the ground as they kept an eye on a stream of real-time flight data received from the PC-24. Had the need arisen, these experts could have given the pilots crucial decision-making information: another means of ensuring the safest possible conditions for the entire maiden flight. Stan Kuliavas, VP sales and business development for Pilatus Centre Canada, was equally thrilled with the result. A total of three PC-24 prototypes will be built and used to complete a rigorous test program of some 2,300 hours over the next two years. Fewer than half those hours will actually be flown in Switzerland, the remainder will be flown elsewhere. Certification and initial deliveries of the first aircraft to come off the production line are planned from 2017. 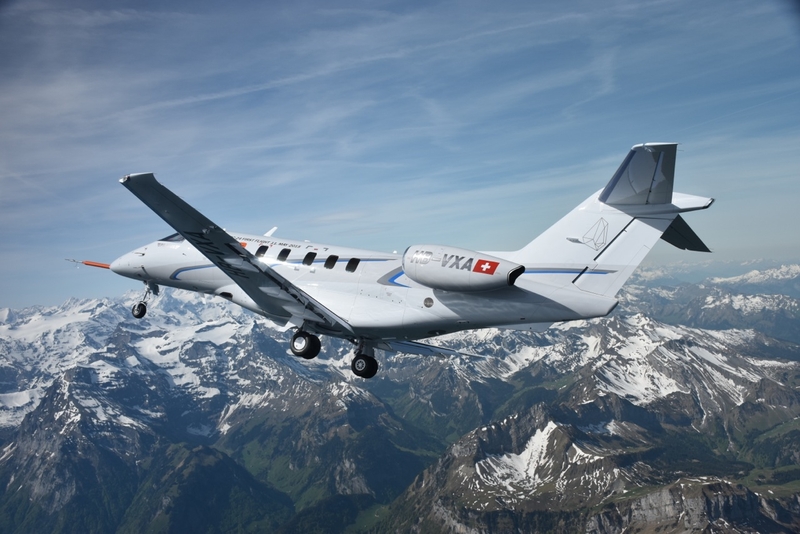 Pilatus sold 84 PC-24’s in the space of just 36 hours at last year’s European Business Aviation Conference & Exhibition (EBACE) in May. The PC-24 is the world’s first business jet to be equipped with a cargo door as standard, with takeoff and landing performance that allows the use of very short and even unmade runways. The jet also boasts a spacious cabin with an interior which can be customized to accommodate individual customer needs.